"This book deserves credit for its comprehensiveness. 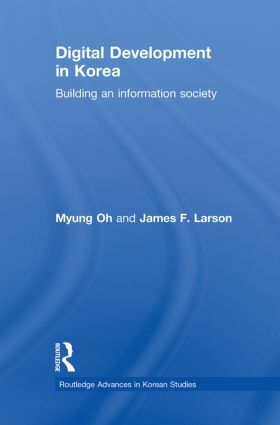 Considering that many previous studies have focused on either supply or demand side or on a specific time period, this book addresses ICT development of Korea from both sides throughout the past three decades… This book is recommended for those who are interested in ICT policies and their impact on ICT adoption, scientific innovation and digital industries." - Sujin Choi, Department of Radio-TV-Film, University of Texas at Austin; Telecommunications Policy (Spring 2013). Chapter 5: The Mobile Revolution: Early Innovation and the "iPhone Shock"
Dr. Myung Oh is a former Deputy Prime Minister and holds a Ph.D. in electrical engineering from Stony Brook University. As his writings, both published and unpublished, make abundantly clear, his scholarly interests embrace the social, cultural, economic and political implications of what has become possible through electrical engineering. Dr. Oh is a well-known and widely admired public figure in South Korea and internationally, mainly for the central leadership role he played in the nation’s information revolution beginning in the 1980s. More often than any other individual, he is acclaimed as the “godfather” of Korea’s telecommunications revolution. He served longer as a leader in the Ministry of Communications (Seven years and seven months as Vice-Minister and Minister during the 1980s) than anyone else in the history of that Ministry. Subsequently, he became Chairman of the 1993 Taejon International Expo, Minister of Construction and Transportation, and Minister of Science and Technology. The final position carried with it the designation of Deputy Prime Minister. James F. Larson came to Korea initially as a 23-year old American Peace Corps Volunteer. He taught English for two years at Kangwon National University, then returned to the United States, where he completed a Ph.D. in Communication at Stanford University in 1978. His next experience in Korea came as a senior Fulbright grantee, teaching and conducting research at Yonsei University in 1985-86. That led to a major research program on the Seoul Olympics and his book (with Park Heung Soo) on Global Television and the Politics of the Seoul Olympics. He met Dr. Oh Myung a few years after the Seoul Olympics, during the early stages of planning for the Taejon International Expo. That meeting led eventually to two years of research and the publication of The Telecommunications Revolution in Korea. James Larson’s research interests are strongly complementary to Dr. Oh’s, including television coverage of international affairs, its role with other new media in the modern Olympics, and the interplay of media, public opinion and foreign policy.